LOU REED: THE BLUE MASK: 1982: 4 1/2 STARS OUT OF 5 STARS: The Blue Mask was my first Lou Reed album and it is one of his best. It was a period where Reed was settling down- he had gotten married, was about to turn forty. The guitarwork of Reed and Robert Quine stand out on this album. Favorites- Underneath The Bottle, My House, Waves of Fear, The Day John Kennedy Died. JOHN LENNON: SHAVED FISH: 1975: 4 1/2 STARS OUT OF 5 STARS: A collection of all the John Lennon singles released in the US up until his 5 year retirement- save Stand By Me. A good collection. Some of Lennon’s best songs though were album cuts which of course are not represented among the 11 songs here. JAMES TAYLOR: GREATEST HITS: 1976: 4 STARS OUT OF 5 STARS: Greatest hits up until 1976- there would be more and there are other Cd’s out there that cover his career- but most of his best songs are on this album. My Mount Rushmore of James Taylor- Fire and Rain/ Carolina In My Mind/ You’ve Got A Friend/ Something In The Way She Moves. Not a big JT fan. LINDSEY BUCKINGHAM: GO INSANE: 1984: 5 STARS OUT OF 5 STARS: My favorite Buckingham solo album. Recorded while Fleetwood Mac was on hiatus. When hasn’t Fleetwood Mac been on hiatus? Go Insane the single peaked at #23. I thought I Want You also had hit potential but it was never released as a single. JOE WALSH: BUT SERIOUSLY FOLKS: 1978: 4 1/2 STARS OUT OF 5 STARS: Joe had been with The Eagles a couple years when he released this solo album. Life’s Been Good would be his biggest hit #12 and the album went to #8. I bought the album at the time due to Life’s Been Good- but quickly found out that while that was the best song on the album- the rest of it was pretty good too. Over and Over, Second Hand Store, Indian Summer my other favorites. Great block of music here though I disagree a tad bit with your ratings. If I may be so bold (and I guess I am since I’m doing it) I don’t understand Shaved Fish being 4 1/2 starts and Go Insane being 5. I realize Shaved Fish is a compilation album, but what a compilation album it is. To me, Go Insane is a solid 4 and the rest of these albums are 5’s. But that’s just me. Good point but I should have noted like I have on some of these other greatest hits best of type deals- there are newer and better options- than Shaved Fish- if you want John Lennon- which includes album tracks that were not singles. I would give for example the Working Class Hero best of which came out in 2005- a double album with 38 songs a 5 stars… same with the James Taylor greatest hits- it came out mid-career- you can get a more complete look at his career today with other cds.. I should have stated that out front. Feel free by the way to disagree with my ratings. I wish I’d kept my vinyl of ‘But Seriously …’ My CD version has a ‘humourous’ duck chorus after Life’s Been Good’ but I seem to remember a reprise of Weirdos or Tonorrow being there on the LP. Nowadays I tend to play songs, but back then any LP would be played from start to finish. Consequently you knew what was coming next. I had a compilation called Modern Dance back in the early 80s. I played it so many times that if I ever hear John Foxx’s ‘Europe After the Rain’ I expect The Cure’s ‘Charlotte Sometimes’ (which was next on the LP) to come thundering in after. LOL.. I know the feeling- When I play a song in my head- at the end the next song from the album will come in….and for the most part it is the correct order.. I don’t know why but I never have been someone who skipped over a song even when it was a song i didn’t like. I probably wouldn’t give Go Insane a 5, but I have a lot of time for it – lots of weird, catchy pop. 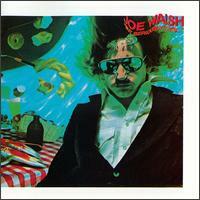 I need to check out Joe Walsh solo and more Lou Reed sometime. Lou Reed once said that his albums were each like a chapter to a book- or something of that order- and The Blue Mask would certainly fit into that description.